“I had fun once – it was awful”; “It’s not me – It’s you”; and “Nope” are phrases commonly associated with Grumpy Cat, the frowning feline who became an internet sensation for her mean mugging memes. Unless we are dealing in patent law, intellectual property and animals do not frequently overlap. Even though a Federal Judge has ruled that a monkey cannot own the copyright to his selfie, there are other ways that animals (or rather, animal owners) can utilize intellectual property law to protect their originals works and brand. Grumpy Cat, for example, is protected by several federal copyrights and trademarks. 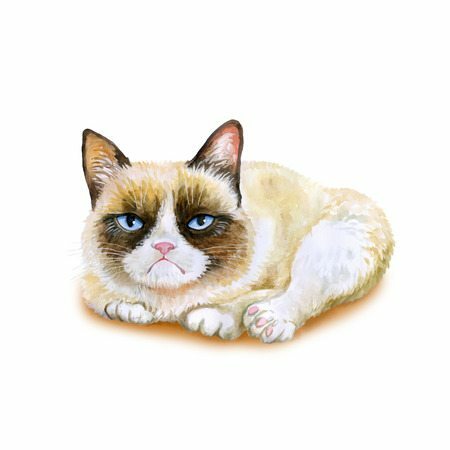 With Grumpy Cat originating as a picture on Reddit before going viral, her owner’s would have difficulty combating infringement activity without registered IP protection. While actually policing memes is a difficult and sometimes controversial task, Grumpy Cat most benefits from her IP protection in regards to merchandise. After Grumpy Cat’s popularity skyrocketed, her owners began producing items such as magnets, mugs, socks, shirts, plush toys, cards, phone cases, and more. With such mass production of merchandise, it is only a matter of time before someone else tries to capitalize on the popularity. Most recently, Grumpy Cat sued Grenade Beverage for copyright and trademark infringement stemming from a line of Grumpy Cat roasted coffee, which Grumpy Cat claims was unauthorized under a License Agreement entered into between the entities. Defendants counterclaimed, alleging breach of contract, and breach of the covenant of good faith and fair dealing, among other things. Hopefully it will be determined soon as to whether Grumpy Cat is successful in her enforcement endeavor or not. The important thing is that the copyrights and trademarks are in place for Grumpy Cat to adequately protect her brand far into the future. While no animal has achieved the same level of popularity as Grumpy Cat, the opportunity exists for other famous animals to have robust IP protection as well. Now we just have to wait for the next internet animal superstar to take off before we can realize the full potential.